Enter your details below and we’ll be in touch with your login details for a free trial. Please use your school email address. What's the best thing a student can do to prepare for exams? As teachers, we all know that the very best thing a student can do to prepare for Exams is complete VCAA exam questions... and lots of them! Sure, there are plenty of other resources out there, and no doubt students need to have their skills up to scratch before launching into practice Exams, but nothing beats being familiar with how VCAA exam questions are written, and knowing how to answer them. It's true, the written solutions to the VCAA papers are readily available, but as teachers, we know that's often not enough for students. With a written solution in front of them, sometimes a student can work backwards from the solution, sometimes seeing the solution triggers an idea for how to solve the problem (and how many times have I done that when stuck on an obscure question?!). But both of these options are luxuries that students don't have in the Exam room. Teaching students how to start from the beginning of the problem can be different for every problem, and often, our students are left to just figure it out for themselves. There simply isn't time for going over how to start each problem in the day-to-day lessons of the classroom. Plus, during the year, the students aren't always ready to hear this advice. It's too early for them in their journey. When are they ready for Exam advice? Teachers know that in most cases, students are ready for exam-strategy lessons in September, but by then, teachers have such precious few hours to pull it all together for them. Ian and I built MTP because wanted to be able to give our students the help they needed when they needed it most. At home, during the September holidays. What do students need to know to be successful with Exam Questions? Check that their solution is reasonable. Empower students to get the help they need when they need it, rather than rely on you during SWOTVAC. Students are added to the site in one click. Your students can go over questions again and again. Each year when listening to the 'meet the examiners' lectures run by the MAV, I think - 'I must remember to show them that question'. But each year, time just seems to slip away. Before we wrote MathsTurningPoint, I kept lamenting that I wished I had time in class to show them a VCAA question that related to the content they were covering at the time. With Methods this can be tricky though, as each content area seeps into the next one. I tell parents at PT nights that Methods is like a web. Come Exam time, students need to be able draw on lots of skills and knowledge from lots of different areas in order to piece the puzzle together. Finding discrete questions that relate to the exact thing we're covering can take me hours of trawling through past papers. "You didn't teach us that"
Students would also complain (a lot!!!) that test questions looked nothing like 'what I'd practiced', or worse, 'what you taught us'! With MathsTurningPoint Platform up and running, however, I was able to put together a suite of emails that sent students a link to one question each week that was hyper-relevant to the content they were doing at that time. If it was the start of the unit, I directed them to an Exam 1 skills-based question. If it's towards the end, they'd be exposed to a more application-style question. My students really loved it! It wasn't confronting, as I wasn't shovelling more 'work' down their throats, and there was no shame or exposure if they didn't know what to do. They just had to attempt the question, and if they didn't know what to do, they just had to watch me walk them through it. Students told me that it was great, because they could jump on at any time and watch the solution unfold before them. They could also view the solution at any time - during study breaks, at the bus stop, travelling in the car etc. With a school licence agreement, I'll put together a custom series of emails, one per week, that links a VCAA question directly to your teaching plan. *This feature is only available for Math Methods in 2017. Freda and Ian are both full-time teachers at a secondary school in Melbourne, teaching across the different year levels and ability groups. To find out more about us, please click here. If you have any questions or would like pricing information for purchasing a school licence please contact us here. 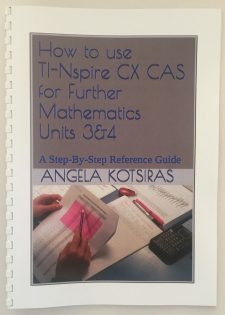 Angela Kotsiras is a well-renowned maths teacher with a wealth of knowledge and experience and is a real leader in the industry. She has a fabulous page dedicated to maths teachers where she gleans the best of what's out there in cyber-space and puts it all in one convenient location. This is a must-have resource for Further Maths students. Visit Angela's webpage for more details.